Photo by kind permission of Ewa Angantyr, Sweden. Black, White, Pink, Purple, Brown, Green, Forest Green, Burgundy, Red, Blue, Orange. Also available are, Yellow Mix, Red/white/blue and White/black. Noseband E is a wide noseband. Approx. 1.25" wide. 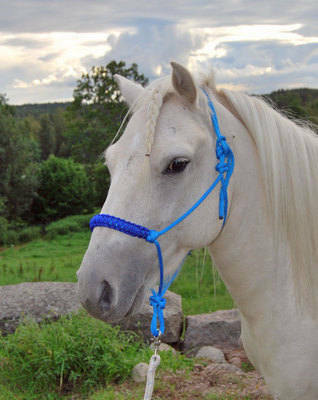 Photo showing the rope colours available for the halters is available on the rope halter listing. Made in exactly the same way as the other halters but with a braided noseband.